Designing a computer roleplaying game is a lot like preparing an adventure for your real-life gaming group, except you won't be there to game master in person. You have to send a computer program instead, and it's just not the same. A machine can't tell if the players are having fun. It can't make a monster weaker on the fly if they're having trouble, or fudge a roll of the dice to prevent frustration. Allowing a clever unanticipated course of action just because it's so cool that the players thought of it is simply out of the question. 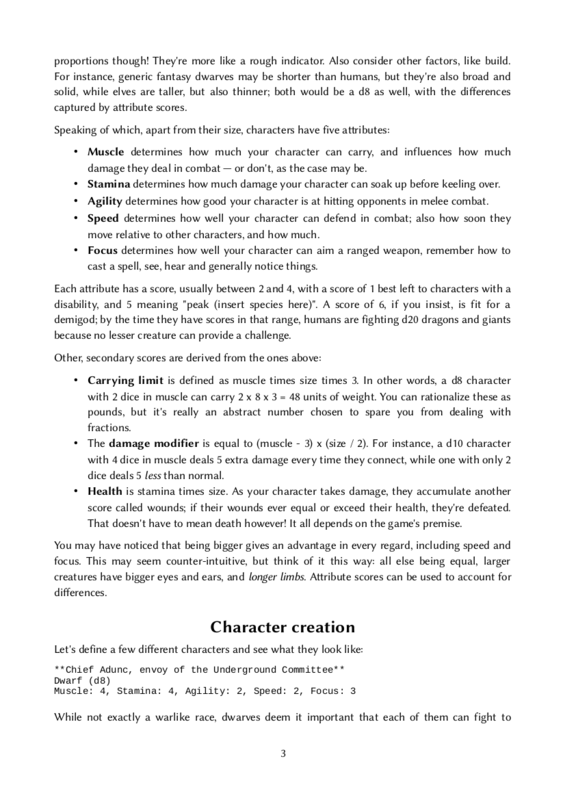 Trouble is, rule systems for tabletop RPGs are usually written with the assumption that you can. That you will be there in person to improvise wildly when the situation calls for it. An assumption that infamously breaks down when such a game is converted to a digital format. This is where Battles&Balances comes in. 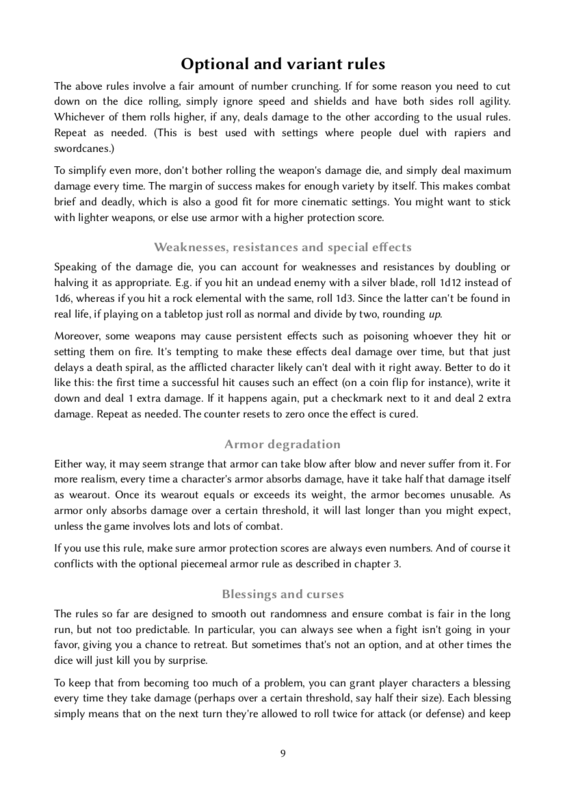 It supports computer games first: every stat has a couple of uses, and they all interact in simple, clear ways. You can easily compare the power of various monsters and character builds, and be reasonably certain they won't be too strong or too weak. On the other hand, every change matters, so choices have meaningful impact, and combat involves lots of little modifiers to take into account. 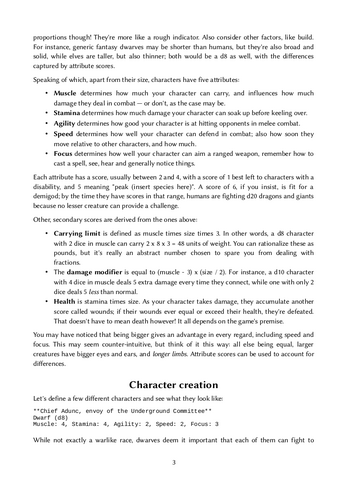 What you get: a 14-page PDF with rules for character creation, equipment, combat and magic (all tested in actual released games). 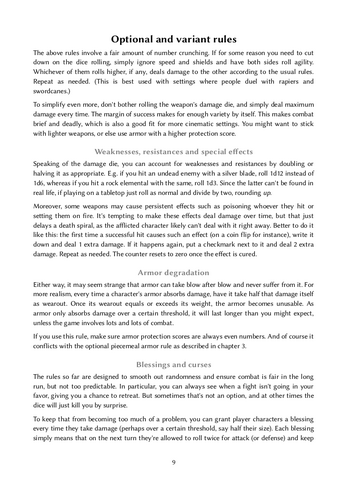 Plus: variant and optional rules, rationales and considerations, even some ideas for the future. More to come.